Hidden cults, forgotten relics, and mystic mayhem are classic components of the Tomb Raider games, but there are plenty of almost equally odd stories from the development of the iconic series. Crystal Dynamics Senior Community Manager Meagan Marie, and the Co-Heads of Crystal Dynamics Scot Amos and Ron Rosenberg shared a handful of behind-the-scenes stories with us that span from way back in 1996, at the debut of Tomb Raider in all her pixelated glory, to the release of Tomb Raider: The Definitive Edition in 2014. Lara is the most iconic female character in video-game history, but the early designs for Tomb Raider’s protagonist were a lot less feminine. The main character started off as a chap named Fletcher Christian, before he was reimagined as Laura Cruz, a South American archeologist and mercenary, who was inspired by the indomitable punk Tank Girl and singer Neneh Cherry. After multiple barrels of tea and seeing bulldogs frolic around, Union Jack flags in their mouths, Core Design decided to make Laura Cruz a quintessentially British character. She was renamed Lara Croft and became the woman we all know and love today. One of the essential ingredients for Lara is her long braid which swings from side to side as she leaps between stone pillars, solves puzzles, and fills bad guys full of lead. Eagle-eyed fans will have noticed that she didn’t have a braid in the original Tomb Raider. Being released in 1996 might have meant that the Spice Girls and Tupac were at their height, but there was a limited number of polygons that could be displayed at one time, meaning the braid had to go. The trademark hairstyle made its in-game debut in Tomb Raider II, where Lara went from 250 polygons to 450. You might wonder what the chances are that an NPC would be a doppelganger of someone in real life, but believe it or not, it has happened. A French archeologist named Jean Yves was featured in Tomb Raider: The Last Revelation as a longtime friend to Lara. He was removed from future games after a real French archeologist named Jean Yves noticed the similarities between himself and the in-game model. Only the most dedicated of fans will have picked up on this before. Everyone knows that mysterious smile of the Mona Lisa has enthralled spectators for generations, but if you look closely at the Mona Lisa in 2003’s Tomb Raider: The Angel of Darkness’ Louvre levels, Mona’s face has been replaced with a picture of composer Peter Connelly, who worked on the game, after a “heavy night out”. I think Da Vinci would see the funny side, don’t you? Possibly the biggest proposed reinvention of them all, 2010’s Lara Croft: Guardian of Light was almost a side scroller. Early on there was a debate between team members with strong champions arguing for side scroller and top down designs. What better way to duke it out than have each side divided into a mini team, with the goal of proving their vision on screen. Although the prototype for each direction came out well, the team agreed that the top down direction was the way to go after the prototypes were completed. It’s fair to say that 2013’s Tomb Raider was a complete overhaul of the Lara Croft players had become used to, which meant although the destination would be worth it, the journey to get there was tricky to say the least. Luckily, two blockbuster films had set a precedent for reinventing canonical characters: Casino Royale and Batman Begins, both with grittier protagonists than what had come before. Scot Amos, Co-Head of Studio, told us that as Casino Royale and Batman Begins had come out several years before, they became a reference for the team when they talked about getting Lara updated to modern gamer sensibilities and expectations. Although the original design for Tomb Raider was about Lara on an island by herself without support, early in development an internal design team investigated the possibility of making the game a co-op experience. Co-op would have included specially-designed crewmates that people would use to play the game together as they struggle to survive in the wilderness, fight off wolves, and uncover secrets. The team eventually moved away from the co-op experience for the game, but the prototype crew mates stayed and became a core part of the single player experience. 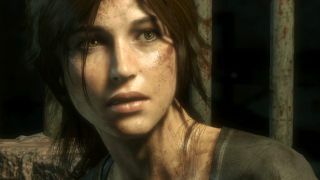 Game developers have a reputation for being extremely competitive and secretive, but the team at Rocksteady Games was a great supporter of the Tomb Raider team. After completing a complete revamp of Bruce Wayne and his batty alter-ego for Batman: Arkham Asylum they were met the Tomb Raider team and shared some of the development processes they had used to develop the game. They were even kind enough to share their proprietary task tracking software called Rocktrack with the studio. Those among you who like to create mind-blowing intricate, challenging levels that make friend and foe alike burst into tears at there mere thought of completing it will be stunned to hear that Lara Croft and the Temple of Osiris almost had a build-your-own-tomb level. Ron Rosenberg told us that the team built a system that would allow fans to make their own tombs, which was based on a simple system that allowed players to “string together gameplay Legos” to create their very own dastardly level. Unfortunately it didn’t make it into the final cut.